Do I need a 3D scanner? The 3D printing industry is growing like Jack’s Beanstalk, and so are the verticals of 3D printing in every business under the sun. But that would be just the output, so what do we do about the input? We already have options to design what we need to 3D print using any CAD application, then how would we be able to duplicate an existing product, tool, jewelry or a toy? The answer is a 3D scanner – its a device that analyses a real-world object or environment to collect data on its shape and possibly its appearance (e.g., colour). That collected data can be then used to construct a digital 3D model. A 3D scanner can be built using various different technologies, each technology has its pros and cons (i.e., limitations, advantages and cost). If you are an early adopter of this technology and want to start from the basics you should definitely give the He 3D Ciclop 3D Scanner a look. This 3D scanner is the cheapest and the most versatile 3D scanner available in the market at a very bare minimum price of $145.00 (DIY Kit Un-assembled) you can get an assembled 3D scanner by adding another $100.00 to the initial $145.00. The Ciclop 3D scanner is a 100% open source project. This makes the 3D scanner upgrade ready, customizable and future ready. The Ciclop 3D scanner is an open source 3D laser scanner with a rotating platform. It has been developed from scratch by bqLabs, and now it has been released to the community, under Creative Commons Attribution – ShareAlike 4.0 International License. This 3D Scanner is composed by a structure of 3D printed parts and screws, a web cam, two line lasers and a turntable platform with a stepper motor. The Ciclop 3D scanner is Windows, MAC and Linux compatible, the software is easy to use and calibrate. The usual scanning time is around 2-8 mins depending on the details on the scan. The turntable can hold a maximum weight of 3 kilograms (around 6 pounds). 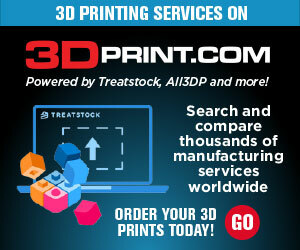 Mr. Peter Smith is Senior Sales Consultant of 3D Printers Online Retail Store Limited. Discuss this affordable new technology further in the He 3D Ciclop 3D Scanner forum over at 3DPB.com. Kick Off the Holiday Season With MatterHackers’ Third Annual Blue Friday Sale!